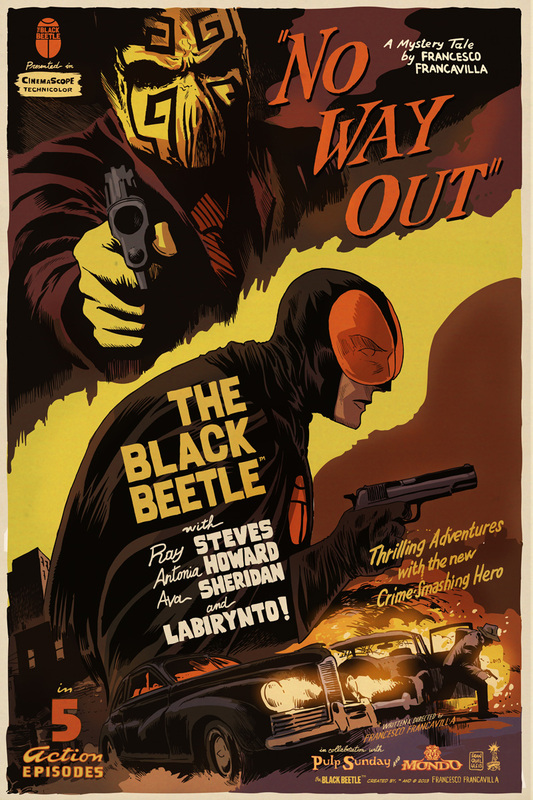 Mondo is pleased to announce a screen print based on the comic book The Black Beetle by comic artist and creator Francesco Francavilla. The variant will be sold this weekend at HeroesCon in Charlotte, NC on Saturday (June 8), where Francesco Francavilla will sign copies in person. Follow @f_francavilla and @MondoNews for the exact sale time and location. The regular will be sold online at a future date on MondoTees.com. Follow @MondoNews for updates. The Black Beetle is centered on a pulp-noir character and takes place in a fictional universe that’s based in Colt City. The character debuted on the pages of Pulp Sunday, Francesco Francavilla’s blog devoted to all things pulp, and had a brief life as webcomic before stepping in the print world with an ashcan first, and on the pages of Dark Horse Presents anthology later. Francesco quickly realized that many fans were interested in exploring this world with him, so soon after the short run in DHP, a new 4-issue mini – titled “NO WAY OUT” – was released. The first 2 issues have sold out and have required DH to go back to press for a second printing. With issue 4 coming out next week and with the first hardcover volume – also titled “NO WAY OUT” – available for pre-orders right now, there is no better time to jump on board of the fantastic adventures of The Black Beetle. The Black Beetle is a Detective/Vigilante SuperHero – His mission is to fight crime in Colt City. We don’t know who he is, not yet anyway. We do know that he has access to some advantaged technology and that he is patrolling the city streets and protecting the citizens the best he can. He is –after all- one man. Colt City is a fictional city set in the late ‘40s America on the East Coast and has a very “pulp” vibe to the city’s depiction and inhabitants. Mondo is an art gallery and online store devoted to a passionate love of film, art and music. The company has received global recognition for bringing art back to movie poster design and has emerged as one of the leading curators of classic and contemporary film soundtracks on vinyl. Utilizing the talents of world-class artists and designers, Mondo produces limited edition, screen printed posters based on film, television and comic properties, working with companies like DC Comics, HBO, Marvel, Paramount Pictures, Universal Studios and Walt Disney Studios as well as filmmakers including Paul Thomas Anderson, Guillermo Del Toro, Zack Synder, Quentin Tarantino and Edgar Wright. Based in Austin, TX, Mondo operates out of a permanent gallery space that hosts regular exhibitions featuring a blend of breathtaking original artwork and limited edition screen prints. Mondo is also recognized by the Academy of Motion Picture Arts & Sciences with a full archive of film posters as part of their research library. The parent company of Mondo is Alamo Drafthouse. ← HEROESCON 2013 GUEST LIST UPDATE :: JIM STERANKO! !